I thought you might be interested in this community project. The stage in the Ã�ras, Carndonagh Community School last Wednesday was lush and brimming with the best plants the season had to offer. The plants and shrubs were supplied by Carndonagh garden centre and set the scene for one of the most innovative garden designers in the world of horticulture, Diarmuid Gavin. Fresh from his success at last weekend's Irish Film and Television awards where he won the IFTA for 'Best Factual Entertainment Show,' Diarmuid arrived in Carndonagh this week to begin a series of consultations with local schools and community groups. These sessions will form the design concepts for the Barrack Hill town park taking into consideration the thoughts of over 130 participants from the area. The celebrity gardener and landscape architect was asked to take on the challenge of satisfying a whole community by the playground committee in the town. Together they have teamed up with the Public Art Office and the Community and Enterprise Section of Donegal County Council to design and create what will be one of Ireland's most imaginative and ambitious community spaces and play parks. Denis McGonagle on behalf of the Council welcomed Diarmuid and commented that the park was a long time coming. "It's amazing to have someone of Diarmuid's calibre involved in the park, which will be a flagship for Inishowen. Everyone will get the chance to contribute on the project and it is important to remember that this park, when completed will belong to and be maintained by the community"
Aideen Doherty from Donegal County Council was extremely positive about the open evening. "The talk gives everyone a chance to see who Diarmuid is and where his influences come from," she said. Besides hearing from people at the open meeting, Diarmuid will be consulting with groups of children and teenagers from schools as well as older members of the community. Dermott is used to dealing with exacting clients but not 130 at one time. "This is the most clients Diarmuid has ever had to deal with!" Aideen exclaimed, "But if anyone can get the community to agree on the finished project, it's Diarmuid". His contributions to the Chelsea flower show have given him the reputation of being innovative and a little controversial especially with his "Colourful Suburban Eden" also known as the bubble gum garden, where he placed hundreds of brightly coloured plastic balls on sticks around a foliage backdrop. "Some of his ideas can be a bit frightening," said Mary Reilly from the Inishowen Organic Network "but I love his work. It gets your mind going and his ideas are never boring or conventional," she stressed. A relaxed and casually dressed Diarmuid addressed the attentive crowd. " This is by far the most people I have ever consulted with on a project," said Diarmuid. "Satisfying a whole community is top priority and listening to everyone's needs will be the key to the success of the project," he continued "There are three main issues for this project - budget - practicality and safety. Some of the school children have come up with fantastic ideas and it is a question of taking these on board and making them a reality. There are a few issues on ideas such as the iPod docking station and the possibility of making the park look like the set on I'm a Celebrity- Get Me Out of Here, which relies heavily on rope bridges and tropical trees, but I am sure we will come to a suitable compromise!" It is apparent that Diarmuid will no doubt get a few tongues wagging with his ideas but this is something that excites him in his development as a designer. "When I left the Botanic gardens in Dublin, I came across a book called "Paradise Transformed, the Private Garden" by Guy Cooper and Gordon Taylor. The radical imagery of their designs really had a big influence on me and I knew that that I was better suited to garden design than any other aspect of gardening," he said enthusiastically. "The completed Barrack Hill Park will have to feel real and be rooted in the soul. It cannot be imposed on the town." He emphasised. Diarmuid will be returning to Carndonagh in April and will have a rough draft of the plans to run past everyone who is involved in this fantastic project which will help to lift the profile of not only Carndonagh but the whole of the peninsula. Sounds like an interesting project, rope bridges and all if possible. Looking forward to seeing the first draft. 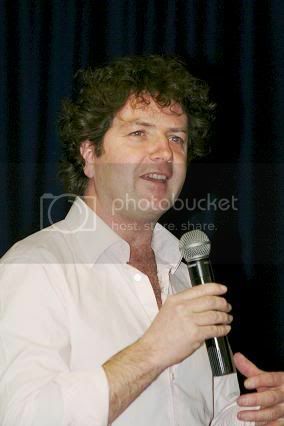 How did they manage to pull in Diarmuid Gavin inishindie? Any idea of what he is charging for this?